If you want to be able to deal directly with a range of independent and non-related hotels, resorts and serviced apartments in Palm Beach then Ozhotels is the right place you you. The Queensland holiday destination of Palm Beach on the Gold Coast has many great palces to stay and in order to save money and get the best possible rates for your Palm Beach accommodation you should book online with the properties listed on Ozhotels. The Gold Coast holiday destination of Palm Beach is well placed in the heart of all the action that this exciting region has to offer. This is why travellers from all over the world choose to stay in one of the many fully self contained holiday apartments, luxury resorts, affordable hotels and budget motels that are available in Palm Beach. This wide variety of place to stay makes finding the ideal holiday property a difficult and time consuming task, which is why many people like to use the free services of an accommodation expert like OzHotels. Doing this allows them to compare hundreds of different properties that are situated all over Palm Beach, in order to find the one that meets their specific requirements and travel budget. The main advantages of booking online with OzHotels is that you can book your travel a long time in advance and that you will be able to get an extra discount off the already cheap rates the longer that you holiday in Palm Beach. 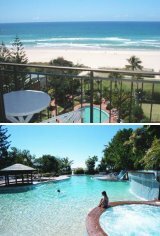 The Currumbin Sands Apartments are situated where rolling surf and a calm estuary meets the golden sandy beach. This 4 star, low rise Palm Beach accommodation is set on almost 11,000 square metres of idyllic beach front property centrally located at the southern end of Palm Beach, only 10 minutes north of the Gold Coast airport and 20 minutes south of Surfers Paradise. The Currumbin Sands on the Beach is ideally locatedonly minutes walk from the central business district of Palm Beach with its numerous restuarants, cafes, shops and surf life saving club. This affordable family Palm Beach accommodation is also only a short drive to major shopping centres, playgrounds/parks, golf courses, theme parks and hinterland adventures to satisfy all of your holiday adventure needs. At the Currumbin Sands Apartments Palm Beach guests can either stroll on the beach, swim or surf in the magnificient pacific ocean or fish and play in the still waters of the Currumbin Estuary. Enjoy everything that southern Gold Coast has to offer at the Currumbin Sands On The Beach. 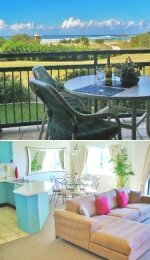 The luxury 1 & 2 bedroom self contained apartments at the Princess Palm On The Beach provide holiday makers with the ideal Gold Coast holiday accommodation. 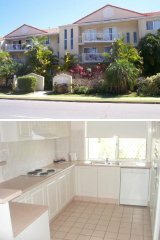 Princess Palm On The Beach Gold Coast Resort offers a choice of 1 and 2 bedroom self contained apartments. The Princess Palm in Palm Beach is has no roads to cross to get to the beach, as well as having a numerous guests facilities and services including internet access, faxing facilities, free car parking, fitness equipment, lift, sauna, spa, outdoor swimming pool, tennis court, tour desk, bbq, garden, security and baby cots for hire. The Palm Beach Parklands, cafes, shops restaurants, playground and the Estuary are just a short walk away and the Gold Coast Airport, Currumbin RSL, local Surf Clubs and Currumbin Wildlife Bird Sanctuary are also close by. For exceptional value for money discount apartments in Palm Beach on the Queensland's Gold Coast stay at the Palm Beach Holiday Resort. 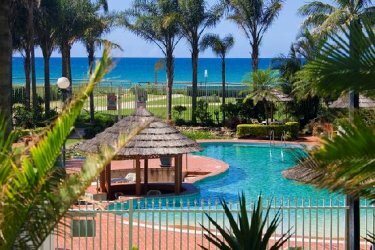 This budget Palm Beach accommodation offers holiday makers and families a choice of 1, 2 and 3 bedroom fully self contained holiday apartments in a fantastic beach setting only 60 metres to the magnificent Palm Beach. The Palm Beach Holiday Apartments is also situated close to all of the tourist attractions that Surfers Paradise and the Gold Coast are famous for. The rooms at the Royal Palm Resort consists of spacious, fully self contained holiday apartments right on Queensland's beautiful Palm Beach. Each of these 4 star Gold Coast apartments features a full modern kitchen, laundry facilities, cable TV and ocean views from the balcony of each apartment. Holiday makers and families will love the convenient location of the Royal Palm Resort. You can walk out of your apartment past the lagoon swimming pool and directly onto the pristine sands of Palm Beach with no roads to cross. Also close by to this fabulous Palm Beach accommodation are a number of restaurants, shopping centres, golf clubs, sporting venues and the Gold Coast's own Jupiter's Casino. 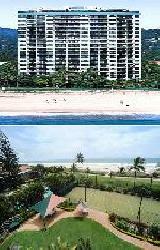 The Royal Palm Resort on the Beach is the ideal family apartment accommodation for your next Queensland holiday. 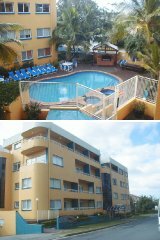 For affordable and spacious family holiday accommodation on the Gold Coast stay at the Sea Mist Palms Apartments. Ideally situated in Gold Coast's Palm Beach the Sea Mist Palms Apartments is central to both Surfers Paradise and Coolangatta and is ideal for the discerning overseas or interstate traveller. These 4 star, fully self contained 2 bedroom Gold Coast apartments have been tastefully furnished and consist of large living areas, master bedroom with queen size bed and ensuite, kitchen with dishwasher & microwave oven, laundry facilities and large balconies and terraces with spectacular views. Relax and enjoy the very pleasant beach front holiday accommodation at the Sea Mist Palms on the beautiful Queensland Gold Coast. For more Palm Beach Apartments click here.